Credit rating system plays a vital role in the life of the company as well as in investors. In case of the company , it helps in arranging the source of finance in the capital market and in case of investors it gives protection to the investors against risk by indicating the credit worthiness of the borrower . Fair and good credit ratings motivate the public to invest their savings. 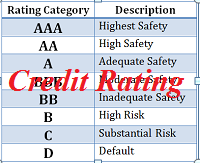 Credit rating can be defined as the credit threat linked with the financial instrument or body. In other words, credit rating can also be defined as the opinion about the credit quality of the financial instrument/ entity. Under this the credit rating agencies give the rating to the entity based on their testimonials and the extent to which their past borrowings and lending mentioned in their financial statements are reliable. The tools used by these credit rating agencies are very simple, easily recognizable and the investor can easily distinguish between the debt instruments. they are either in alphabetical or in alphanumeric symbols. These symbols point towards the current views about the debt instruments. It conveys the message to the investors, regarding the ranking of defaults loss probability when compared with other rated instruments. Purchasing or selling of securities is not recommended by the credit rating agencies. It is related with an act of assigning values by estimating worth or reputation of solvency, and honesty so as to repose the trust in person’s ability and intention to repay. The ratings assigned are generally regarded in the investment community as an objective evaluation of the probability that a borrower will default on a given security issue. Default occurs whenever a security issuer is late in making one or more payments that it is legally obligated to make. If , we talk about the bonds, the situation is different. The bond is lawfully in default if, it fails to pay the interest and the principal amount in time. Sometimes the companies repay back to the bond holders otherwise companies are declares as insolvent. Bond or debenture rating agencies which do the rating of debentures and bonds issued by government or corporate. Equity rating agencies which do the rating of the equity shares issued by companies. Preference share rating agencies which do the rating of the preference shares issued by companies. Recently we have celebrated Teachers’ Day that eulogise teacher-student relationship. Traditionally the role of a teacher is to share information and knowledge with students and encourage them to learn the subject. But with the world entering into internet age, the role and expectations from a teacher has undergone a lot of transformation. Now students get all the updated information from internet. This made the job of a teacher much more difficult. A great teacher today will not only be the one who can simply impart knowledge but also who can understand student as an individual and mould knowledge as per his needs, so that he/she can absorb the knowledge and set it in use. Many scholars, researchers and academicians have identified conventional teaching as an incomplete learning process where students will not learn or absorb all the knowledge as she / he may be dealing with other social, emotional or psychological pressures during the learning phase. Here the use and integration of Social and Emotional Learning (SEL) in education particularly higher education play a great role in improving learning. SEL stands for Social and Emotional Learning. It is education about managing one’s emotions and psychological health and using them positively to thrive in every sphere of life. Be it personal, professional or social life. It is the process through which one can effectively acquire knowledge, attitude and skills necessary to understand and manage emotions; set and achieve positive goals; and feels and show sympathy. It helps in maintaining positive and warm relationship around the students and helps them in making responsible decisions. Idea of integrating SEL in school and higher education is quite prevalent in most developed countries where the emotional and physiological well-being of both students and teachers are of equal importance. These programmes have flourished in schools during the last decade across the globe. However, researchers and practitioners of social and emotional learning (SEL) striving hard to include SEL in higher education as it is of paramount importance to young students who goes through a lot of emotional, psychological changes during their youth days. Transition to higher education often involves forging new relationships with classmates, an entirely new peer group, and faculty and staff who serve in loco parentis. Thus, higher education students experience a heightened need for self-management, social awareness and relationship skills. These programmes also help teachers to explore and built their own emotional well-being. The pivotal concern of these programs are to facilitate students’ social and emotional learning and in order to help students achieve a degree of well-being, teachers own emotional well-being is also promoted. For years, researchers and practitioners of social and emotional learning (SEL) are working on these areas and determine the best practices available for intra-personal and interpersonal skills enhancement, problem prevention, health promotion, and positive development (Collaborative for Academic, Social, and Emotional Learning [CASEL], 2012; Elias et al., 1997). The SEL works on five competencies of a human being: self-awareness, self- management, social-awareness, relationship skills and finally responsible decision making. Self-awareness: Accurately recognizing one's thoughts and emotions, and their influence on behaviours; accurately assessing one's strengths and limitations; possessing a well-grounded sense of self-esteem, self-efficacy, self-confidence, perceived control, and optimism. Self-management: Effectively regulating one's thoughts, emotions, and behaviours; managing stress; savouring emotional wellbeing; successfully engaging in skills such as coping, problem solving, mindfulness, relaxation, and positive and productive thinking. Social awareness: Identifying appropriate social resources and supports; displaying accurate perspective taking, respect for others, and empathy. Relationship skills: Establishing and maintaining healthy relationships; seeking and providing help when needed; communicating effectively; negotiating conflict constructively; solving interpersonal problems. In fact, research has demonstrated that Social and Emotional competencies in these five SEL domains are critical to higher education students' development, adjustment, and success. Poor self-management in students can lead to symptoms of emotional distress, such as depression, anxiety, and stress, which are consistently noted among the most prevalent and challenging adjustment problems facing higher education students (Adlaf, Gliksman, Demers, & Newton-Taylor, 2001). Building up these five core competencies through SEL can help students in managing their lives better. One can also work on these five competencies on his/her own by consciously thinking about them and implementing them in real life. After a child crosses the threshold of his home ,the next best thing any pushy parents want for him is good education. The Republican party nominee for USA presidential election in 1940, Wendell L Willkie said : “Education is the mother of leadership” Also the Sanskrit said : “Avidyajeevanam sbunyam” meaning life without education is empty.- entails much truth in it and underlines the importance of education.as brick of foundation is to the building,education and learning is to human development. Better the foundation, stronger the building, that’s why most of the Indians pray before Saraswati, the goddess of knowledge – Tamso ma jyotirgmaya – lead me from darkness of ignorance to the light of Knowledge. Nelsoon Mandela south Africa first democratically elected president, said : “Education is the most powerfull weapon which you can use to change the world. Human minds are instinctively inquisitive and it seeks answers to the questions it raises. Man wants to unlock the doors of mysteries and histories of the world. And the secret of satiating this quest for answers is education that gives knowledge and knowledge has limitless power . Education has long lasting effects.The future of any society or nation depends on the education of children.